I can’t remember when or where I got this polish… all I know is that it’s been lying around unused for who knows how long. Gotta say, I’m kinda kicking myself for leaving it so long! 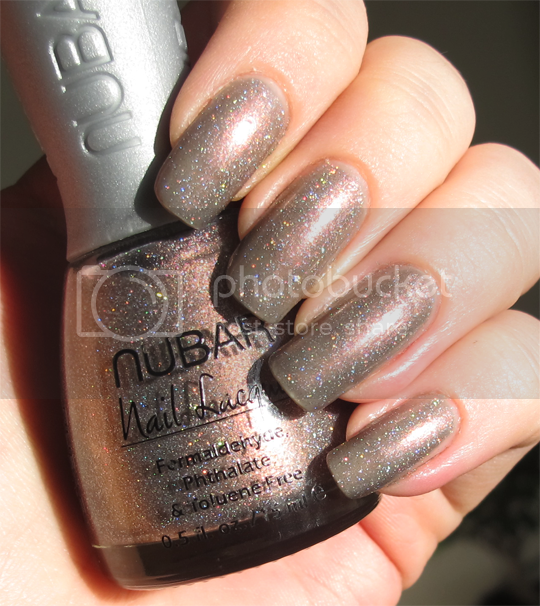 This is Nubar Gem, and a gem it most certainly is! Gem is from Nubar’s Prism collection, and much like Prize from the same collection it’s definitely more of a layering polish than a standalone one. Unlike Prize, it’s really quite understated for something which contains holographic glitter particles. I would describe the colour as a cool toned taupe with some lilac tones – which made Liz Earle Grey Dawn the perfect polish to layer underneath it. The holographic pieces in the polish are small enough that it doesn’t take an age and a ton of elbow grease to remove, but they do shine wonderfully in the right light. The size of them also means the polish is smooth to the touch rather than gritty, which is always nice when you can’t be bothered to apply eighty four layers of topcoat to smooth it out. One thing I completely failed to capture in the photos is the strong pink-purple flash this colour has to it in the light. I really tried but my camera just wasn’t having any of it unfortunately. You can kind of see it in the first photo – I hope you can see what I mean! You can buy Nubar nail polishes from FeelUnique, where the Prism collection polishes are currently on sale for £7.40. Screw you RMK, I’ll do it myself!